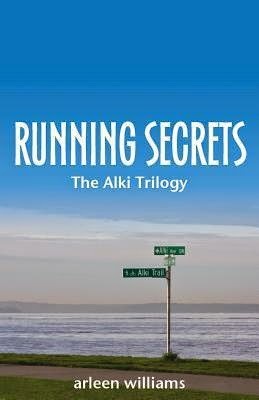 Arleen Williams is the author of two books: Running Secrets, the first novel in The Alki Trilogy and The Thirty-Ninth Victim, a memoir of her family’s journey before and after her sister's murder. She teaches English as a Second Language at South Seattle College and has worked with immigrants and refugees for close to three decades. Arleen lives and writes in West Seattle. To learn more, please visit www.arleenwilliams.com. Isn't chocolate one of the major food groups? Rich, dark and decadent. Maybe it's generational or maybe I'm just clueless. I've heard of the first one. Give me a moment while I google them. Gin. On ice. A thick slice of lime. The perfect post-workout pain tonic. I can't make a choice without experiencing both. I've camped all my life. Backpacking into the Pacific Northwest wilderness, preferably midweek, is an ideal escape from my hectic schedule. Should I try a spa vacation? Definitely mountains, unless of course we're talking tropical water. I'm in the Pacific Northwest where the ocean is frigid and the lakes never warm up quite enough for my taste. Here I hardly want to risk being on a boat for fear of getting splashed. Now Hawaii? That's a different story. Dogs. But honestly, I could live without the dog hair and dirt my daughter's pooch leaves behind. And no, Toby is not allowed in my new car. Morning coffee - dark French roast, strong and black. Can anyone really function without it? Afternoon tea. Preferably decaf. I do need my beauty sleep. Why would I want to clean up at home if I'm not cooking? I think take away should be limited to picnic options. They each have a place and time in my life. But honestly my feet prefer clogs. I love the feel and smell of physical books, especially a new hardcover. But the convenience and environmental advantages of e-books are undeniable. I especially enjoy being able to read my e-book in bed at night in the dark without keeping my husband awake. Really, I just like not annoying him. Hardcover if it's a book I want to treasure in my home library. But I also shop a lot at my local secondhand bookshop for the $3 paperbacks. Pentel Client ball point. No, I'm not getting paid to say that. I really love the feel of this pen. I use nothing else. Mad and Bad do nothing for me. I enjoyed the first few seasons of Abbey, but I'm easily annoyed when I'm left hanging and have to wait half a year to find out what happens. I like a solid beginning, middle and end - all within a reasonable two hours. I'm done with television shows. Comedy. I've got enough drama in my life. I rarely seem to remember any of it - except when my lips start peeling. So chapstick, I suppose. I've got my hands full with FB. I couldn't possibly add Twitter to the social media mix or I'd never get another book written. I have a clear idea of beginning and end, and I plot out most of the story using a detailed scene list. But that list is in constant flux as I write. The story goes where the characters take it. In RUNNING SECRETS, flight attendant Chris Stevens is bent on self-destruction until she meets Gemi Kemmal, an Ethiopian home healthcare provider. Gemi and Jake, a paramedic, help Chris heal from and confront her difficult past, and regain a passion for living. In the process, Chris and Gemi forge a friendship that bridges cultural, racial and age differences. Their friendship gives both women the support each needs. Gemi comes to question restrictive traditions dictating her immigrant life, such as the headscarf she’s worn since entering puberty and the celibacy she’s practiced since the brutal death of her husband and infant in the violence that destroyed her homeland and family. Chris uncovers family secrets that challenge everything she's ever known to be true. Together the women learn that racial identity is a choice, self expression is a right, and family is a personal construct.